In addition, interested parties have the opportunity to submit questions concerning the Company prior to the call to Stuart Smith at SmallCapVoice.Com, Inc. via email: [email protected] by 12:00 PM eastern standard time on Monday, February 26, 2018. Mr. Smith will compile a list of questions and submit them to the Company prior to the conference call. Which questions will be addressed will be based on the relevance to the shareholder base, and the question’s appropriateness in light of public disclosure rules.To access the call:Dial-In Number: 1-857-232-0157 Access Code: 422095For those unable to participate in the live conference call, a replay will be available at https://www.smallcapvoice.com/ngtf/ shortly after the call has concluded. 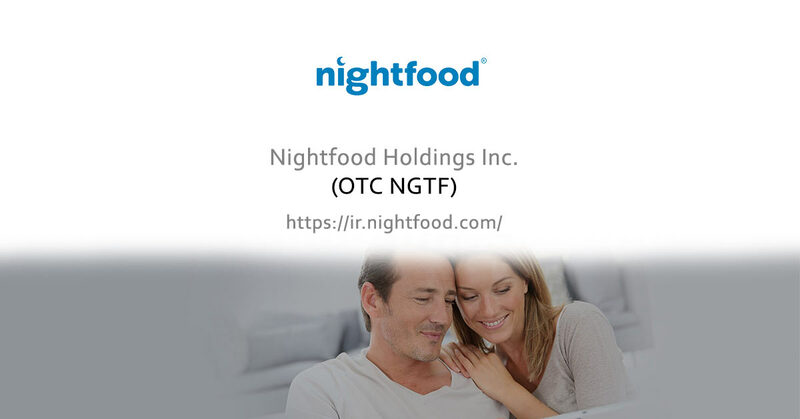 An archived version of the webcast will also be available http://ir.nightfood.comAbout NightFood: NightFood (OTC: NGTF), operates both NightFood, Inc. and MJ Munchies, Inc.NightFood, Inc, “The Nighttime Snack Company”, is a snack food company dedicated to providing consumers delicious, better-for-you, sleep-friendly choices for evening snacking and nighttime cravings. According to IRI Worldwide, 44% of snack consumption occurs at night, representing a consumer spend of over $1B weekly on nighttime snacks.Market research giant Mintel recently released a report identifying nighttime specific food and beverages as one of their most “compelling and category changing” trends for 2017 and beyond.Currently, consumers’ most popular choices are cookies, chips, ice cream, and candy. These options are generally understood to be unhealthy, and often contain ingredients and nutritional profiles that can impair sleep quality. NightFood creates, manufactures, and distributes snacks formulated to help consumers satisfy nighttime cravings in a better, healthier, more sleep friendly way.MJ Munchies, Inc. was recently formed as a new, wholly owned subsidiary, to exploit legally compliant opportunities in the CBD and marijuana edibles and related spaces. The Company intends to market some of these new products under the brand name “Half-Baked”. MJ Munchies recently acquired the valuable domain name, HalfBaked.com. As the legal landscape around CBD and cannabis related products continues to change and evolve, MJ Munchies will continue to explore, identify, and capitalize on opportunities clearly defined as legal. The Company believes tremendous opportunities currently exist to launch successful and compliant products in this space, and that such opportunities will continue to grow over time.For more information, visit http://ir.nightfood.com and www.nightfood.comQuestions can be directed to [email protected]Forward Looking Statements:This current press release contains “forward-looking statements,” as that term is defined in Section 27A of the United States Securities Act of 1933 and Section 21E of the Securities Exchange Act of 1934. Statements in this press release which are not purely historical are forward-looking statements and include any statements regarding beliefs, plans, expectations or intentions regarding the future, including but not limited to, any products sold or cash flow from operations.Actual results could differ from those projected in any forward-looking statements due to numerous factors. Such factors include, among others, the inherent uncertainties associated with distribution and difficulties associated with obtaining financing on acceptable terms. These forward-looking statements are made as of the date of this news release, and we assume no obligation to update the forward-looking statements, or to update the reasons why actual results could differ from those projected in the forward-looking statements. Although we believe that the beliefs, plans, expectations and intentions contained in this press release are reasonable, there can be no assurance that such beliefs, plans, expectations or intentions will prove to be accurate. Investors should consult all of the information set forth herein and should also refer to the risk factors disclosure outlined in our most recent annual report for our last fiscal year, our quarterly reports, and other periodic reports filed from time-to-time with the Securities and Exchange Commission.Media Contact: Peter Leighton [email protected] 888-888-6444, x5Investor Contact: Parker Mitchell Regal Consulting, LLC [email protected]SmallCapVoice.com, Inc. received $875 from the company on 3-1-18 for 30 days of audio interview service.